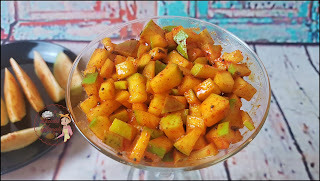 This summer try this 2 steps, instant, tangy and spicy raw mango pickle(कैरीचे लोणचे). 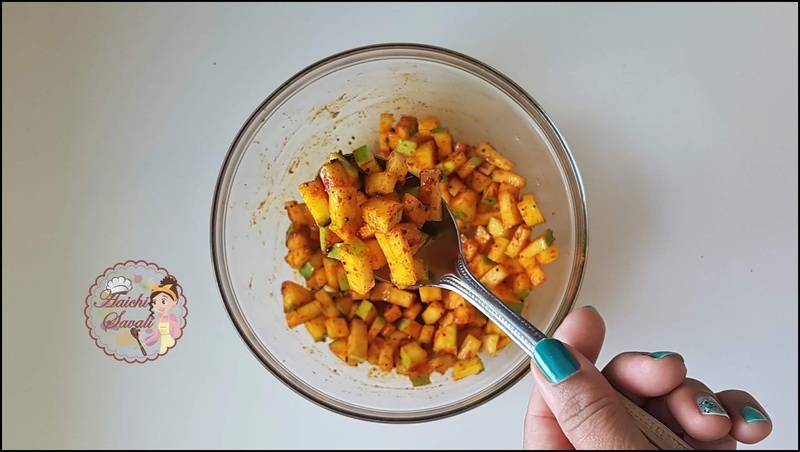 Vibrant color, a tangy-juicy taste of raw mango and flavored with some basic Indian spices, this homestyle pickle reminds me of my back home and childhood summer vacations. I remember my mother used to bring these raw Mangoes from the vegetable market and prepares this instant pickle and me and my brother used to zest up our meal with this mouthwatering pickle. Ohh my! I still remember the taste, yummy. It's ridiculously amazing! So this weekend when we went to the Indian grocery store I bought this raw mango and prepared this instant mango pickle. And you don't believe we(me and my McDreamy) finished it in one sitting😜. Also, I am sure if you prepare it once, you keep preparing it again and again. It's addictive, perfect for the summer and most important it's yummilicious, you will ever enjoy! 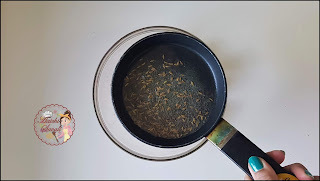 This is my mom's recipe, I got to know how simple it was to make this instant pickle from her. 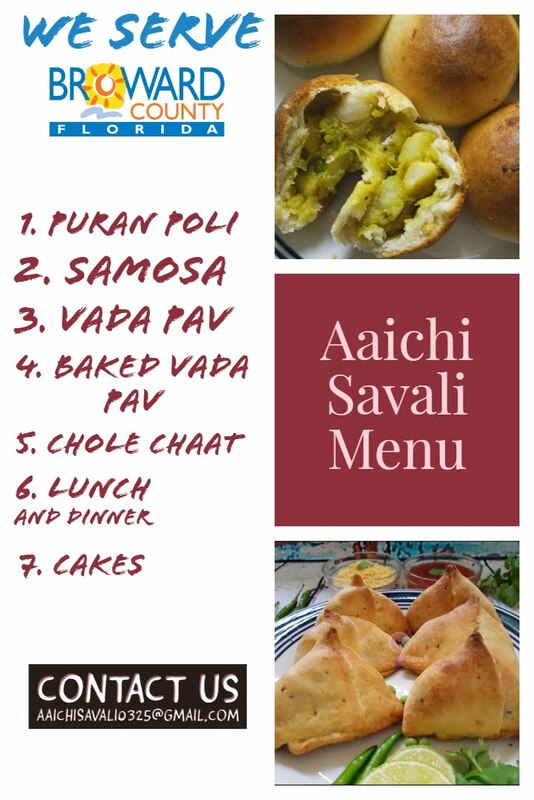 There are a few recipes that I make every year, every summer that I can store them in the pantry, namely, rice kurdai sabudana papad and now this. We all love to munch on raw mango and eat its different dishes and drinks because it's just delicious. Apart from being tasty, mangoes also offer a lot of health benefits. 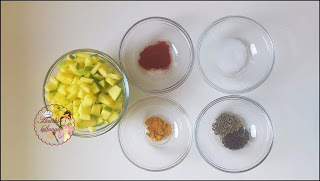 How to Prepare Instant Mango Pickle? 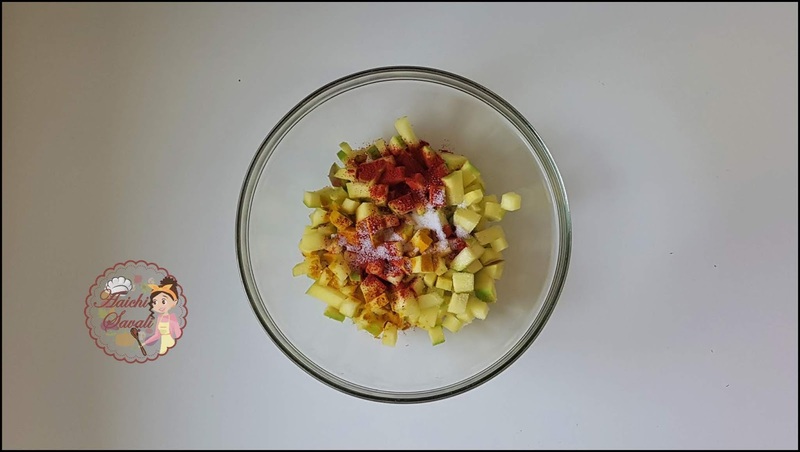 All you have to do is find a good quality green mango or raw mango or Kairi. Wash them under tap water to remove and dirt, chemicals. Dry them thoroughly before chopping. Then chop them into small cubes and mix with red chili powder, turmeric, salt. Finally, temper it with some oil and Cumin-Mustard seeds. Voila! Instant Mango Pickle is ready to slurp. How to Store it and shelf life of Instant Mango Pickle? The salt and oil keep them safe for a while at room temperature, but they will likely go bad before you finish eating the whole bowl unless you refrigerate them. It will be edible for 2-3 days at room temperature. If kept in the refrigerator in an airtight container it will be good to eat for up to 1 week. Be sure to always use a dry and clean utensil to pull them out. Preparation and Cooking Time: 5 Minutes. 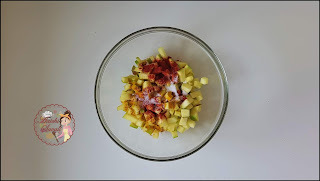 In a bowl add chopped raw mango, turmeric, red chili powder, and salt and mix well. Heat oil in a pan and splutter cumin-mustard seeds and temper raw mango and mix well and keep aside for 5 minutes. 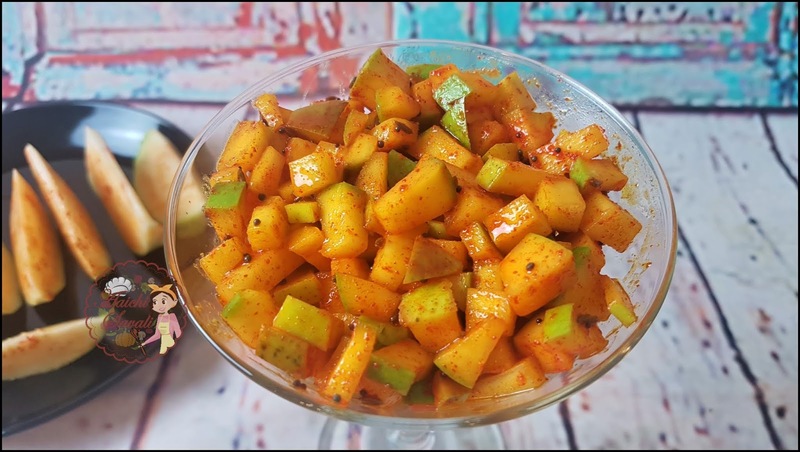 After 5 minutes instant, tangy and tasty raw mango pickle is ready to serve. Enjoy!!! Per serving contains 124 calories, along with 18.6 g carbohydrates, 3.35 g dietary fiber, 6.11 g fats, and 1.75 g protein. Protects from intense heat and dehydration. It is a good source of Vitamin C that helps to treat scurvy. It helps ease digestion and control constipation.